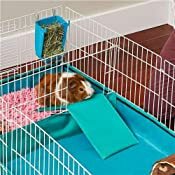 The Guinea Pig Habitat "Plus" by MidWest Homes for Pets is an interactive and expandable habitat cage for your Guinea Pig. The "Plus" features a multi-access folding top to protect your Guinea Pig or pet from predators. Each Guinea Pig Habitat "Plus" includes a leak-proof, durable PVC lined canvas bottom that is hand-washable. The 'Bigger is Better' interactive and expandable habitat / small animal cage is designed with Guinea Pigs and their owners in mind and provides 8 sqft of living area for you Guinea Pig to ensure they have enough room for play and exercise. 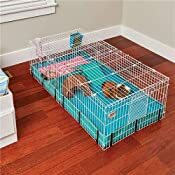 Each Guinea Habitat "Plus" comes with a divider panel to separate your pets playing / living area from their litter box to assist in the proper hygiene of your pet Guinea Pig. This habitat sets up in a matter of minutes with no tools required. Since Guinea Pigs are social creatures MidWest Homes for Pets suggests at least having two Guinea Pigs per habitat. 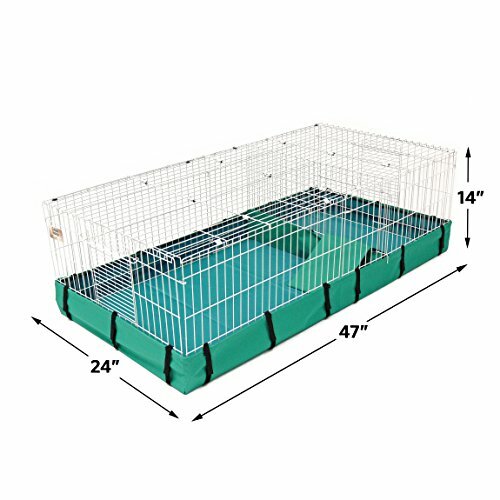 The Guinea Pig Habitat can suit up to 3 Guinea Pigs and provides the right amount of living space recommended by Veterinarian’s and Breeders. MidWest Homes for Pets stands behind the quality of our products with a 1-Year Manufacturer’s Warranty. If you have any questions about the Guinea Pig Habitat “Plus” our customer service department would be glad to help you.